The pressure is on. You need to build a great customer login experience that is secure but doesn’t burden your customers with complicated password requirements. But wait, there’s more – you also need to personalize the login experience and provide metrics back to the business. Legacy authentication has you boxed in. What are you to do? Solutions like multi-factor authentication (MFA) are replacing traditional login methods but its limitations are often static and offer up inconsistent customer experiences, leading to abandonment. Organizations need an intelligent authentication approach that strikes a balance between usability, security, and customer choice. La réglementation PSD2 ne concerne pas que les institutions financières mais aussi toute société proposant un paiement sur son site. Quels sont les avantages ? Projetons nous dans 6 mois lorsque cette réglementation sera en place à travers une simulation concrète. In today’s digitally transformed world, digital trust is a prerequisite for doing business that is hard to earn but very easy to lose. New technologies bring many ramifications from a security perspective. The number of devices and environments to protect continues to grow, complexity increases, but the traditional security perimeter is no longer an option. Continuous Innovation drives change in how we think about identifying users and securing systems. In this world, identity becomes the new perimeter for securing digital assets, and can even enable us to infuse continuous risk assessment into authorization decisions. The demands of a friction-free digital experience can certainly make this task more challenging, but there are ways to strategically approach the convergence of Identity, Security and Fraud. With our partners at BRC, this webinar will explore how retailers can effectively manage their customers’ identities to optimise the online user journey. Gain an understanding of how and what information you are collecting about your customers online and how you can use this to boost customer loyalty and ultimately growth in your online sales. Organizations are under pressure to quickly embrace DevOps and move workloads to the cloud in order to accelerate business growth. According to Gartner by 2020 75% of organizations will have deployed a multi-cloud or hybrid cloud. With this opportunity also comes significant challenges for identity teams including a lack of resources and skill-set to deploy identity across multiple cloud environments. This results in lengthy and expensive deployments. Without an identity platform that can support multi-cloud deployments, whether on AWS, Google, Microsoft Azure, etc. it is difficult for organizations to meet and scale with organizational and customer demand. Unfortunately, most businesses are making the fundamental mistake when it comes to authentication and are thinking inside-out, but by thinking outside-in, they would automatically put the Customer first. Until now, strong (and not so strong) authentication to services seems to have been driven by an inside-out way of thinking. The institutions think about what works best for them: what fits into their infrastructure; what is the cheapest yet compliant approach? For customers, this means that they must use what their service provider offers to them. Companies must also be aware of insider risks and by implementing a Zero Trust approach of ‘never trust, always verify’, they can better secure the access to their assets. Finding the right balance between security and risk is a tough one to manage. Banks and financial services organisations face larger challenges because of their complex legacy systems and the amount of sensitive data they have to deal with. -What are the key challenges we see in the industry adopting and adapting the technology? -How can businesses know when they have got identity management right? -What are the barriers to making this happen? -How will IoT and AI change how we think about, and manage, identity? -How can we make identity an enabler of, rather than a barrier to, innovation? -How is Open Banking and PSD2 affecting and impacting the wider industry? In this webcast, KuppingerCole´s Principal Analyst Martin Kuppinger will introduce the concept of Identity Management for the Internet of Things. Following Martin's opening talk, ForgeRock´s Gerhard Zehethofer will discuss how ForgeRock is now extending these capabilities into the areas of managed and unmanaged devices, enhancing the customer experience as well as security and privacy at scale for people, services, and things. Plus: We’ll take you beyond AWS and discuss alternative approaches to containerized deployment. The following partner(s) of the the above webcast(s) will have access to the list of registrants, including your contact information. Discover how running your IAM on AWS gives you the exact solution that you want with the operational model of a SaaS. Join speakers Warren Strange, Engineering Director at ForgeRock and Steve Giovannetti, CTO & Founder of Hub City Media to learn how you can deploy IAM using this model. Don’t fear the move from on-premise Identity to the cloud. Don’t settle for an Identity solution that is anything less than exactly what you need. Authentication and MFA is no longer a one-mode-fits-all experience. Customer-centric companies need flexible intelligence models and simple, consistent login journeys across channels—web, call center, mobile—without being forced to bolt MFA on top of usernames and passwords. ForgeRock’s VP, Global Strategy and Innovation, Ben Goodman, and Trusona’s Chief Design Officer, Kevin Goldman, explain how ForgeRock combined with Trusona creates a broad range of multi-factor authentication modalities all with a consistent user experience, including primary MFA without usernames, passwords or typing whatsoever. Bonus: Trusona will reveal findings from the first-ever passwordless MFA behavioral research. Today’s customers expect tech-savvy, efficient and proactive services that fit conveniently into their digital lives. To meet these expectations, organisations are now competing as digital businesses, offering unique, personalised services that are available from any device – all whilst maintaining security and compliance requirements. As European financial institutions work towards compliance with PSD2, there's an intense focus on securing customer data as it's opened up to third parties. Essential requirements around securing APIs to enable direct payments and account aggregation are accompanied by increased regulations for strong customer authentication. Financial institutions are looking to improve their management of digital identities to ensure customer data remains private. Not only can a modern digital identity platform help companies with API security and authentication requirements, it can also drive innovation in areas like consent management, with dashboards that allow customers to control their personal data at a granular level. Banks can embed identity into their digital platforms in order to use PSD2 as a strategic opportunity to build trusted relationships with their customers. What is the Revised Payment Services Directive (PSD2)? 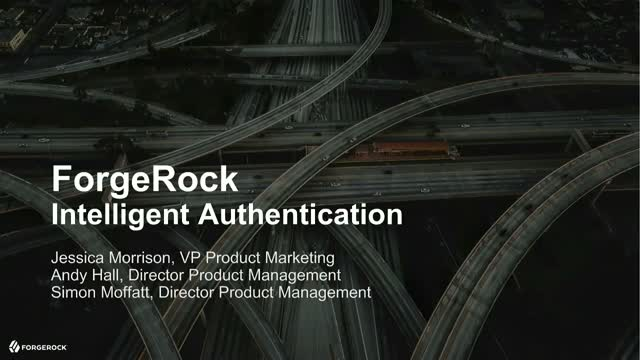 And how is the ForgeRock Identity Platform uniquely suited to address its requirements around strong customer authentication, data sharing via secure APIs, and explicit customer consent for data sharing? This short video explains. A modern connected vehicle is no longer just a car with a built-in wireless access point – it is a complex network of multiple interconnected systems from different vendors that are constantly communicating with each other as well as with various external parties, both consumer-facing and industrial. Each connected car is a rolling IoT ecosystem where industrial applications and protocols coexist with consumer-grade apps and services. Martin Kuppinger, Founder and Principal Analyst, KuppingerCole and Ashley Stevenson, Identity Technology Director, ForgeRock, talk in detail about the complexity of IAM infrastructures designed for connected vehicles. Connect, protect, and manage the digital identities of people and their things. From identity-driven security to delightful experiences, we help large organizations deepen relationships with their consumers and improve the productivity of their workforce with the industry's most modern, complete and trusted identity platform.